Mumbai, 6th July, 2015: The Minion fever is set to hit McDonald’s®, as the world’s leading food service retailer is bringing back the small, joyful, yellow goggled creatures to win over customers and give them a chance to add to their Minion merchandise collection. Minion madness has taken over McDonald’s® happy meal™ and menu, as we are going banana’s this July by offering food items inspired by the Minions and their love for bananas. Customers can now indulge in two delectable new desserts McFlurry® Banana Caramel Oreo and Banana Oreo Soft Serve™, created exclusively to complement the launch of the new movie ‘Minions’ in India. 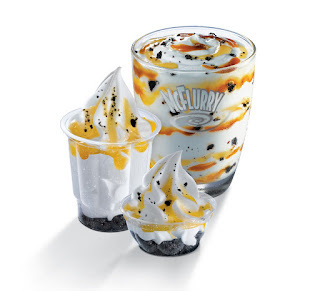 The McFlurry® Banana Caramel Oreo allows you to treat yourself to a generous serving of vanilla soft-serve ice cream whisked with rich caramel and the crunchy goodness of Oreo bits topped with fudgy banana McFlurry®. For those who prefer a different kind of sweetness, try the velvety and luscious Soft Serves™ with crunchy Oreo, mixed with banana syrup. McDonald’s continues to offer customers delicious and enjoyable desserts at great value. The classic Banana Oreo Soft Serve™ can be enjoyed at only Rs 35, while the Crunchy and Creamy Banana McFlurry® starts at Rs 73. Commenting on the association with Minions, Mr. Kedar Teny, Director – Marketing & Digital, McDonald’s® India – West & South India said, “McDonald’s® is committed to enhance the dining experience of our customers. Minions are a popular phenomenon across all age groups and we have therefore integrated them into our menu and in store décor. McDonald’s® constantly creates new and exciting offerings and to this end; we have exclusively designed unique Minion inspired desserts. The campaign will take a multimedia approach and will be promoted across various platforms –TV, radio, digital and outdoor. The TVC engages the young audience while capturing the essence of fun with the unique Minion characters. McDonald’s® has also created a special packaging for all McFlurry® products and Happy Meal box this month. Specially designed merchandise such as funky Minion wrist bands and head gear will accompany the exciting line-up of 10 new minion toys. Customers will be served by a groovy team of crew members dressed in Minion themed uniforms. Mini moments of joy are here! A free Minions toy is available with purchase of any Happy Meal from 10 July 2015, starting from 11: 00 a.m. While stocks last. HRPL serves approximately 185 million customers, annually, at its 209 (as of March 31, 2015) McDonald’s restaurants across 26 cities in the states of Telangana, Gujarat, Karnataka, Maharashtra, Tamil Nadu, Kerala and parts of Madhya Pradesh, and provides direct employment to over 7,500 employees. McDonald’s operates through various formats and brand extensions including standalone restaurants, drive-thru’s, 24/7, McDelivery, dessert Kiosks. The menu features Burgers, Finger Foods, Wraps, Hot and Cold Beverages besides a wide range of desserts. Several of the McDonald’s Restaurant feature in-house McCafé.